I'm obsessed with smoothies right now. I have even made a few green smoothies, but I haven't made a green smoothie recipe I'd care to share...yet. Hopefully I will discover a good mix of flavors soon on the green front. This strawberry smoothie I made yesterday was really good and really simple. I entered the ingredients into the 'my fitness pal' recipe creator. I have had so much fun playing around with creating recipes while counting calories. 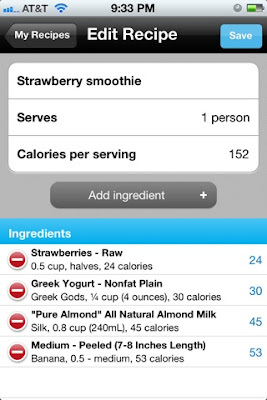 Put all ingredients in a blender and hit the smoothie button! My smoothie was 152 calories and it filled me up. The kids had a similar smoothie, but I used low fat strawberry yogurt, almond milk, honey, blueberries, the other half of my frozen banana. I'm thankful they too are smoothie fans! 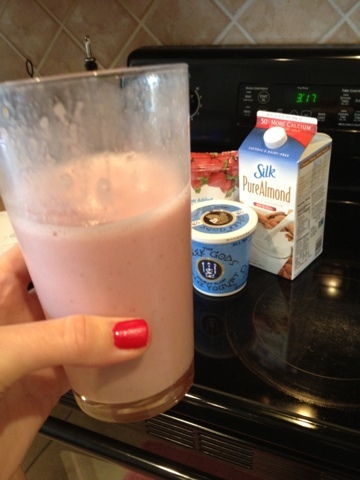 What kind of fun smoothies have you made lately? i am in love with smoothies and juices right now. they are filling and tasty! I love smoothies and do need to try and make them at home. I've seen a few with spinach that people have said are good...we'll see. This post also makes me want an iPhone...lol. I eat a smoothie almost every morning :) yum! This sounds good! I'll have to try it. I've never had almond milk. My fave smoothie is just skim milk, no sugar added Nesquik & banana.